Keeping paint looking perfect is easier than you might think. While exterior detailing is a continual effort in many cases, “re-detailing” should never be in question. Properly corrected paint can be easy kept scratch & blemish free with mindful care methods and attentive application. From a thorough hand wash to unmatched levels of paint correction, our selection of exterior detailing options can perfect your vehicle on the first visit! Services can be combined, stacked, or implemented in any car care routine you have or wish to build with us. We tailor our treatments to your vehicle’s needs, and can easily develop a care plan implemented specifically to your car. 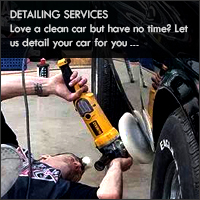 Take a look at all of our exterior services & find the perfect detail to bring your vehicle back to life! Click on a package to read more about what it includes. Onyx Full - 30% Carnuba Wax! Details: Our unique 24 step hand wash is tailored to those not wanting to subject their vehicle to the scratches or the chemical etching caused by automated car washes (yes, even touch-less washes are bad). Rather than worrying about the inconvenient damage caused by these machines, let the pros here at Detail Werkz Dallas take care of it for you. In this thorough process, using overlapping “straight-line” motions we ensure that no spot is missed. After the car is washed and dried, we apply a synthetic spray sealant over all paintwork to help boost your wax/sealant and tires are dressed with a water based non-sling formula. We provide a light dust wipe down and vaccum of the interior. 24 step hand wash over the entire vehicle, wheels, arches, and door, engine and trunk jambs. Vehicle is hand dried using air blowers and synthetic absorber towels. Synthetic spray sealant is applied to paintwork to help boost your wax/sealant. Tires dressed with water based no-sling formula. Embedded/attached paint contaminants such as sap, tar, or other environmental pollutants will not be removed from a wash alone. If your paints surface is still rough after a wash, consider getting a exterior detail which includes a claybar decontamination step.Be sure to ask for a free assessment at the time of your next hand wash to see if your car could benefit from a coat or wax or a detail. THIS SERVICE DOES NOT INCLUDE INTERIOR RECONDITIONING. NOTE: If you have 2+ vehicles and you want the hand wash & pampered you can pick our mobile service. If you only have one vehicle to be washed it has to be performed at our 2652 Brenner location. Details: This detail is designed to top up protection and maintain exterior and interior surfaces in between more intensive treatments. In each case, we start out by using a warm water foaming wash procedure to safely remove all traces of loose dirt and grime from the bodywork, wheels, arches and shuts. We then chemically treat and clay the paint and exterior glass to remove any bonded surface contaminants such as tar spots and tree sap, which leaves these surfaces feeling perfectly smooth. After blow drying the car with warm filtered air, we then apply the Swissvax Onyx wax to the bodywork. A deep interior ph-clean and condition treatment using Swissvax Leather Milk is applied to all the leather. We then complete the detail by dressing the tires, polishing the exhaust tips, cleaning the glass and vacuuming the interior. About Swissvax Onyx Wax: Swissvax Onyx is our standard wax for all colors. With 30% of grade one pure Brazilian carnauba wax by volume, this wax produces a streak-free gloss and water-repellent protection on all types of paintwork including clear coats. We do not open glove boxes or other interior compartments to clean out of respect and privacy. If you want these to be address please remove all contents prior to our arrival. Swissvax Mirage is a premium wax for all paintwork types including clear coats, ceramicoats (so-called nano paints) and lacquers. Thanks to its formulation including 40 Vol. % of pure Brazilian Grade One Carnauba wax it creates an impressive degree of gloss and offers your automobiles paintwork thorough long term protection against all kinds of negative immissions. Thanks to its perfect results it provides, Mirage is very popular both with private collectors and enthusiasts and professional users. Next Service Recommendation: To maintain this level of detail, we recommend hand washing bi-monthly and following up with wax after 2-4 months. Details: This detail is designed to top up protection and maintain exterior and interior surfaces in between more intensive treatments. 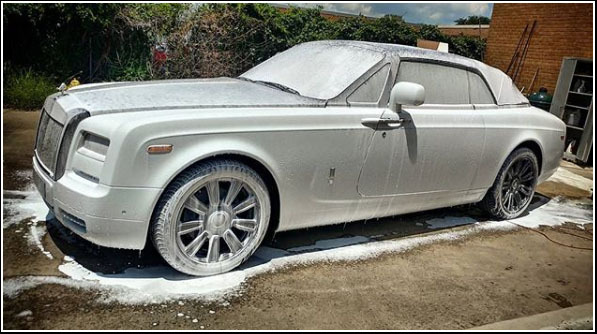 In each case, we start out by using a warm water foaming wash procedure to safely remove all traces of loose dirt and grime from the bodywork, wheels, arches and shuts. We then chemically treat and clay the paint and exterior glass to remove any bonded surface contaminants such as tar spots and tree sap, which leaves these surfaces feeling perfectly smooth. After blow drying the car with warm filtered air, we then apply the Swissvax Concorso wax to the bodywork. A deep interior ph-clean and condition treatment using Swissvax Leather Milk is applied to all the leather. We then complete the detail by dressing the tires, polishing the exhaust tips, cleaning the glass and vacuuming the interior. 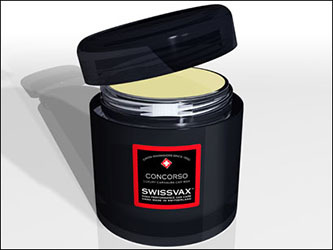 About Swissvax Concorso Wax: Swissvax Concorso is a famous and popular concurs-wax and awarded classic. Its formulation includes a 50 Vol. % of pure yellow Brazilian Grade One Carnauba wax providing an outstanding gloss experience on all paintwork systems with a very deep and intense shine that also makes experienced concurs enthusiasts speechless with amazement. Details: This detail is designed to top up protection and maintain exterior and interior surfaces in between more intensive treatments. 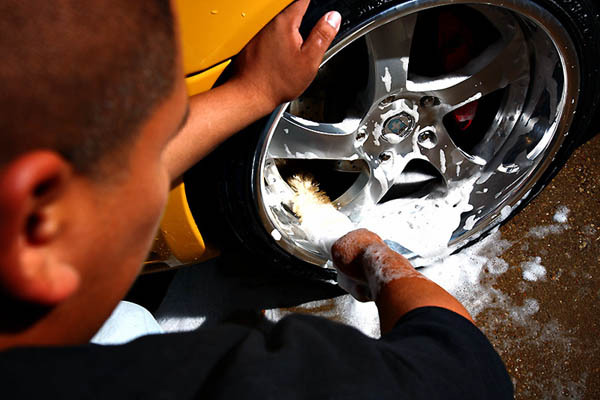 In each case, we start out by using a warm water foaming wash procedure to safely remove all traces of loose dirt and grime from the bodywork, wheels, arches and shuts. We then chemically treat and clay the paint and exterior glass to remove any bonded surface contaminants such as tar spots and tree sap, which leaves these surfaces feeling perfectly smooth. After blow drying the car with warm filtered air, we then apply the Swissvax Shield wax to the bodywork. We then complete the detail by dressing the tires, polishing the exhaust tips, cleaning the glass and vacuuming the interior. The Endurance Full : The Shield Full brings in a higher grade interior cleaner by Swissvax, using a ph-cleaning solution we clean the interior dash, doors and console and then apply the Swissvax Leather Milk to give ultimate deep conditioning and protection to the interior leather seats and other leather items in the cockpit. About Swissvax Endurance Wax: Containing high qualities of PTFE and 40% Carnauba by volume, Endurance offers unparalleled durability and protection - up to nine months depending on driving conditions - as well as imparting a deep, reflective gloss to your paintwork. Colours are brightened and enhanced and flake pops out to greet the sun. Your paint will have a smooth, silky feel and thanks to the carefully-formulated recipe dirt and contamination will struggle to grip onto your car, like an egg in a non-stick frying pan, making regular washing much easier. Details: This detail is designed to top up protection and maintain exterior and interior surfaces in between more intensive treatments. In each case, we start out by using a warm water foaming wash procedure to safely remove all traces of loose dirt and grime from the bodywork, wheels, arches and shuts. We then chemically treat and clay the paint and exterior glass to remove any bonded surface contaminants such as tar spots and tree sap, which leaves these surfaces feeling perfectly smooth. After blow drying the car with warm filtered air, we then apply the Swissvax Crystal Rock wax to the bodywork. We then complete the detail by dressing the tires, polishing the exhaust tips, cleaning the glass and vacuuming the interior. With 78% by wax volume of pure Brazilian carnauba wax, this wax has one of the highest Carnauba content of any wax on the market. In effect, it coats a car's paintwork in a smooth and glossy, yet tough and protective, water-repellent film. A layer of Trilogy can last up to 8 to 12 months (Tested) and can be "topped up" with additional layers for even more protection. When exposed to water, it literally leaves no water spots and the run off is incredable. This leads to the beading and sheeting of water that is characteristic of a car that has been treated with this high content Carnauba wax. The more layers are applied, the more waterproof it is. Caring for your car doesn't get any better. The gloss achieved is second to none! Perfection Redifined!